Step 1: Wash your face gently and pat dry. Step 2: Squeeze out a small amount of product on your fingertip. You should aim for the size of a grain of rice; any less will not be enough, and any more is generally too much and won’t fully absorb into the skin or could cause sensitivity. 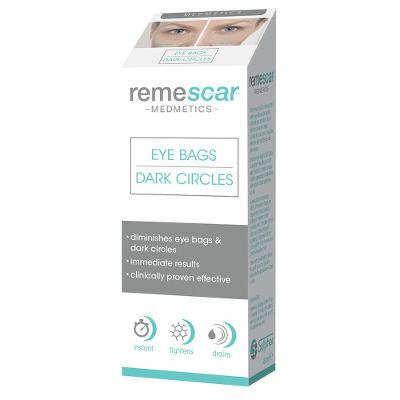 This is one of the key factors to make Remescar Eye Bags & Dark Circles work correctly. Step 3: Gently apply the cream on your entire under-eye area, and smooth it out from the inside to the outside with one finger. Blend in using a light gentle sweeping motion until the cream completely absorbs into the skin. Step 4: Remain expressionless for 2-3 minutes while the product dries to achieve dramatic results (fanning will accelerate the process). Simply tissue off the excess of cream with a bit of water if too much cream is applied. Wash hands and close the tube after use. To Remove: Cleanse applied area with water and pat dry. For under makeup: First, apply your usual products (eye serum, daily moisturizer, etc.) and allow time for these products to penetrate the layers of your skin (a minute or two). Then you can apply a very thin layer of Remescar Eye Bags & Dark Circles to the targeted area as instructed above. If you see a white residue you have either used too much product or did not use moisturizer. Simply tissue off the white residue with a bit of water. Once the product has dried, apply your makeup as usual. Note: Oil-based makeup may reduce the effectiveness of Remescar Eye Bags & Dark Circles.